Spring has arrived early at the Virginia Horse Center. The grass is greening up, horses are getting frisky, and the trees are budding. Just like spring we are beginning again, after thirty years, we are looking forward to a better and newly improved Virginia Horse Center and the future is very bright. In order to serve the Virginia equine community, we must rely on the generosity of individuals and businesses like you for support. The Virginia Horse Center belongs to you. Without the assistance of horse lovers and community minded individuals just like you, we wouldn’t be able to keep our doors open or make much needed improvements. Your friendship and ongoing support is vital to the future of the Virginia Horse Center. Each year we must hit our annual fundraising goal. This year our goal is $560k. We have raised $450k so far! With just three months to go before our fiscal year end of June 30, we need to raise an additional $110,000 to hit our target and keep the VHC strong and thriving. Please DONATE TODAY and help us reach our goal! Every dollar the Horse Center receives from friends like you, regardless of the amount, is a testament to the belief in its mission and future and ensures that quality equine shows and programs will continue at the highest levels. Mary Lisa Leffler and Bling Bling. Photos courtesy of Teresa Ramsay Photography. Lexington, VA – April 13, 2017 – The Virginia Horse Center is pleased to once again host two premiere grand prix events to capstone the Lexington Spring Festival. The $30,000 Rockbridge Grand Prix on Saturday, April 29th and the $30,000 George L. Ohrstrom, Jr. Grand Prix on Saturday, May 6th will both cap off the exciting hunter/jumper action as athletes race to victory. During the Lexington Spring Premiere on Saturday, April 29th, the $30,000 Rockbridge Grand Prix will be held in the Coliseum at 6:30 p.m., where riders will vie for the coveted Dubliner Trophy donated by Margaret Price. Declarations to the show office are due no later than 6:00 p.m. on Friday, April 28th and the entry fee is $500. Both Grand Prix classes held during the Lexington Spring Festival are eligible for inclusion on the Rolex/USEF Show Jumping Ranking List. The pinnacle of the Lexington Spring Encore will be the $30,000 George L. Ohrstrom, Jr. Grand Prix, also in the Coliseum at 6:30 p.m. on Saturday, May 6th. Declarations are due no later than 6:00 p.m. on Friday, May 5th, the day before the class. The Virginia Horse Center Foundation is a 501(c)3 non-profit organization which owns and operates the Virginia Horse Center. The Foundation is proud to be a part of the Rockbridge community, an asset to the state’s equine economy, and a resource to the East-Atlantic competition circuit. The Virginia Horse Center stands at the forefront of Virginia’s $1.2B equine economy. Founded to promote all disciplines of equestrian sport, its 600 acres of picturesque grounds hold a 4,000 seat coliseum, eight barns to accommodate 1,200 horses, 19 show rings including two large indoor arenas, cross-country and combined carriage driving courses, campgrounds, and full catering and café services. To view the prize list or learn more about the Lexington Spring Festival at the Virginia Horse Center, please visit www.horsecenter.org. Lexington, Va. – Feb. 5, 2017 – The Virginia Horse Center Foundation hosted a successful event on January 31, 2017 at the National Sporting Library and Museum in Middleburg, Virginia. Upwards of 30 people were in attendance including members of the Board of Directors and the Advisory Board, as well as friends of the Foundation. Attendees were treated to a private tour of the museum’s current art exhibitions, ‘Picturing English Pastimes: British Sporting Prints at the NSLM’ and ‘The Chronicle of the Horse in Art,’ as well as highlights from the museum’s permanent collection. Founded as the National Sporting Library in 1954, the institution has expanded to become a library, research facility and art museum with over 26,000 books and works of art in the collections. The National Sporting Library and Museum is dedicated to preserving, promoting, and sharing the literature, art, and culture of equestrian, angling, and field sports. Following the tour, a luncheon was held for participants. During the luncheon, Virginia Horse Center Foundation President Ernie Oare and CEO John Nicholson spoke. They addressed the attendees to discuss the mission and vision of the Horse Center, as well as their enthusiasm for the growth that they are seeing in the family and friends of the Horse Center particularly in Northern Virginia. The Virginia Horse Center recognizes that all areas of the state contribute to the overall equestrian culture of Virginia and need each other to succeed. The Virginia Horse Center is here to support all of our friends around the state and in the mid-Atlantic region. To learn more about the Virginia Horse Center Foundation and its mission, please visit www.horsecenter.org. Lexington, Va. – Feb. 1, 2017 – This weekend, the Virginia Horse Center will host the second Stonewall Country Horse show of 2017. The hunter/jumper show, running from Feb. 2-5, will also feature USHJA Outreach classes on Thursday, Feb. 2nd, for exhibitors interested in bringing along their young horses to school before the summer show season begins. The Stonewall Country Horse Show series offers Virginia and Mid-Atlantic residents an opportunity to compete in a National rated horse show environment with two indoor rings and many indoor schooling options. The National rated Stonewall Series will feature professional and amateur divisions for both hunters and jumpers. Competitors who are trying to earn valuable equitation qualifying points will also have the opportunity to do so in the WIHS, ARIAT, and THIS National Children’s Medal classes. Many of these same classes are also qualifiers for the Amy Ylvisaker Reistrup Equitation Challenge, which is held annually at the Lexington National Horse Show in August. With the addition of USHJA Outreach classes this year, horses and riders who are not as experienced in the show ring will also be able to compete in classes that are offered at a discount in both class fees and stabling fees. To learn more about the Virginia Horse Center and their entire line up of exciting events, please click here. Lexington, Va. – Jan. 17, 2017 – Each winter, the Virginia equestrian community looks forward to the Stonewall Country Horse Shows at the Virginia Horse Center. Celebrating their 25th anniversary, these events, which benefit the Virginia Horse Center Foundation, offer two hunter/jumper shows at the facility from Jan. 19-22 and Feb. 3-5. This year, the Stonewall Country series will also feature USHJA Outreach classes for exhibitors interested in bringing along their young horses to school before the summer show season begins. 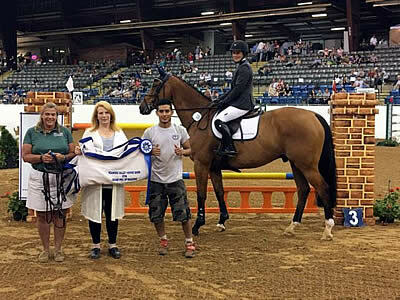 The Stonewall Country Horse Show series offers Virginia and Mid-Atlantic residents an opportunity to compete in a National rated horse show environment with two indoor rings and many indoor schooling options. A complete schedule and list of classes is available here. Virginia Beach based trainer and USEF “R” judge Chris Wynne is enthusiastic about the opportunities that these shows provide for those who are not able to travel to Florida for the winter. Lexington, Va. – Jan. 9, 2017 – The Stonewall Country Horse Show, benefitting the Virginia Horse Center Foundation, is proud to offer two hunter/jumper shows at the Virginia Horse Center Jan. 19-22 and Feb. 3-5. This year, the Stonewall Country series will also feature one day of USHJA Outreach classes during each show for exhibitors to participate in and earn points towards the national recognition. The addition of the USHJA Outreach classes this year will directly benefit horses and riders who are not as experienced in the show ring. The USHJA Outreach program offers a discount for classes, stabling and office fees – making it even easier to help students and young horses prepare for the spring and summer show seasons. 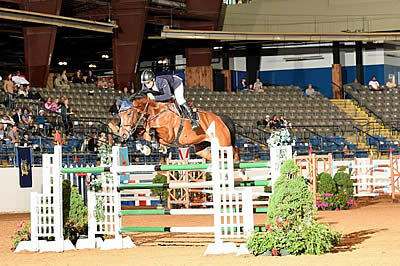 USHJA Outreach classes are available for competitors showing in hunter and jumper divisions. Any rider may compete in Outreach hunter and jumper classes, but riders wishing to earn points and national recognition must be USHJA members. USHJA offers an Outreach Membership for $35. Riders are also required to be members of USHJA (Outreach level or higher) in order to compete in the USHJA Outreach medal classes. Horses are not required to be registered with USHJA to compete in Outreach classes. To learn more about the USHJA Outreach program and classes, click here. To learn more about the Virginia Horse Center Foundation and their upcoming events, click here. Photo Courtesy of David Bell and RideonSports Photography. Lexington, Va. – December 22, 2016 – The Stonewall Country Horse Shows are returning to the Virginia Horse Center in 2017 for its 25th anniversary. The events, which benefit the Virginia Horse Center Foundation, will offer two hunter/jumper shows at the facility from Jan. 19-22 and Feb. 3-5. This year, the Stonewall Country series will also feature USHJA Outreach classes for exhibitors interested in bringing along their young horses to school before the summer show season begins. The Stonewall County Horse Show series offers Virginia and Mid-Atlantic residents an opportunity to compete in a National rated horse show environment with two indoor rings and many indoor schooling options. A complete schedule and list of classes is available here. To learn more about the Virginia Horse Center, please visit www.horsecenter.org. Lexington, Va. – Nov. 22, 2016 – Each year thousands of non-profit organizations participate in a special day following Black Friday and Cyber Monday on November 29, called #GivingTuesday. The Virginia Horse Center (VHC) Foundation is using #GivingTuesday as an opportunity for their patrons to celebrate the VHC Foundation’s 30-year anniversary by donating $30 to their annual giving campaign. This small donation has the ability to help the VHC continue to fulfill their mission of becoming financially sustainable and to provide a preeminent facility for world-class equine events. Every investment, no matter how great or small, in the VHC Foundation enriches the experience for every participant and visitor. The VHC is a dynamic organization that supports the thrill of competition, the special partnership between horse and rider, and a vibrant community. For patrons that are interested in helping the VHC celebrate their 30-year anniversary, there are many ways to get involved. You may make a donation by going on-line to www.razoo.com/us/story/Virginia-Horse-Center-Foundation, or go to their website, www.horsecenter.org, and click the DONATE icon at the top right of each page. If you plan of participating in #GivingTuesday with the VHC, you will be joined by an incredible group of “athlete ambassadors” that are supporting #GivingTuesday with the Virginia Horse Center Foundation, including: Winn Alden, Michael Bertozzi with Cavallo Farm, Will Coleman, Robert Crandell, Phillip Dutton, Brooke Kemper, Mary Lisa Leffler with Rolling Acres, Darrin Mollett with Beverly Equestrian Center, Clark Montgomery, Lauren Sprieser and Don Stewart. To learn more about #GivingTuesday and how to participate in this special event, follow the VHC Foundation and its “Athlete Ambassadors” on Facebook. You can also show your support by including the hashtags #GivingTuesdayVHC and #GivingTuesday in your own posts. To learn more about the Virginia Horse Center Foundation, please visit www.horsecenter.org.